With the advancement in technology, every CTO is busy trying to embrace DevOps approach within their organization. DevOps is a critical process in the business and involves a culture of communication and collaboration between software development and IT operation leading to quality software that will be used in the business. While this may seem easy on paper, the reality of the matter is not so simple. As enterprises and medium businesses increasingly turn to DevOps mentality to deliver software solutions, it is important that these organizations learn how to set up DevOps environment for teams. The following are some tips enterprise CTO should consider when implementing DevOps in their organization. One of the most effective strategies for implementing DevOps in your organization is starting small. According to IT experts, starting your DevOps implementation strategy small will allow you as the enterprise CTO achieve great results which will enable you to scale up hence convincing your DevOps team members about your capabilities. When doing so, it is important to consider resistance factors first. Pay attention to the priority of your businesses activities and implement one process at a time. This is important and ensures that you do not get overwhelmed by things. Good communicators. Since time immemorial, IT specialists have not been good communicators; however, DevOps requires individuals to come clean with their strategies and expectations hence the importance of this point. Team player. It goes without saying that effective execution of DevOps strategy requires a combined effort of different individuals. CTOs are advised to pick a strong team of flexible and cooperative individuals with an average size of DevOps team being five people. Undaunted by failure. When choosing a DevOps team, CTOs are advised not only to pick a team that is not frightened by failure but also one that is prepared to fail. According to Gartner’s research, 75% of business will have to create a DevOps plan by 2018. Out of this statistics, less than 50% of the businesses will be able to reap the benefit. Therefore, the team the CTO chooses should be able to withstand these disappointments. The success of the DevOps strategy is determined mainly by the level of your team’s resilience and how well they can keep up with the industry. A good team is one that will be able to build on its past mistakes and better its prospects. Failure of this may see your team give up on a number of important things that might jeopardize its success. People are the main capital of your company and while you might have the latest tech, without people DevOps approach is practically impossible to achieve. The DevOps evangelist: the person who is willing to be the leader and get everyone to follow him or her. It's the person who's passionate about DevOps benefits for the team and the company as a whole. The release manager - these people coordinate and manage the product from development through production. The automation architect - the one (or team) who analyze, design, and implement various strategies for the product's continuous deployment. The software developer/tester - considering the Dev part of the DevOps, software developers and QA engineers are at the very heart of the organization. Without them, you simply don't really need DevOps. The XA (experience assurance) professionals are the "QA engineers on steroids." Just kidding. These are the people who focus on making sure the product and functionality work well including on the user experience side i.e. that your average user will understand what he/she needs to do to get the product working. The security engineer builds the security into the product not at the end of the development process (as it is often done), but during the development, or even right in the very beginning. The utility technology pro (aka "system administrators") are the team members who operate effectively across development platforms, networks, databases, servers, and tools. If they know development and support details, even better. How does building a DevOps team benefit your organization? Building a DevOps team is not an easy task but one whose benefits outweighs the costs. According to a research of 4600, IT professions carried out June last year, it was established that organizations with a good DevOps plan used software 200 times more than organizations without strong DevOps team. From this, it is evident that both business and customers stand high chances of benefiting from DevOps development. The following are some of these benefits. 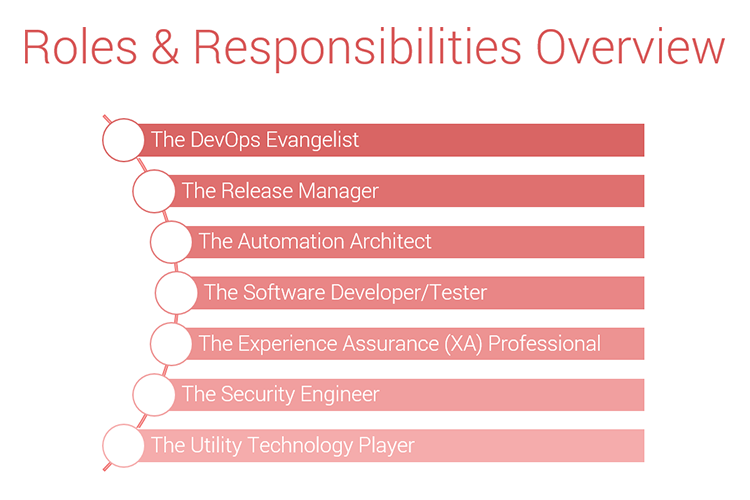 DevOps team structure has helped change the prevailing narrative in IT firms. Thanks to this, IT specialists no longer pay attention to the end goal of their tasks but rather the process thus helping them derive more joy and satisfaction in their jobs. Thanks to the clear roadmap for the DevOps team, organizations can save time on their operational activities. This is important as it helps DevOps teams to concentrate on bettering the organizational software and operations. The advancement in technology is fast catching up with each stage of our life. One sector that seems to be benefiting from these advancements each day is the business sector. Thanks to DevOps team lead, business are not worried about their productivities anymore. Once you have set up a DevOps team, you are guaranteed of enjoying numerous benefits. Follow the above tips to set separate DevOps team and implement them in your business and attest to the amazing rewards.